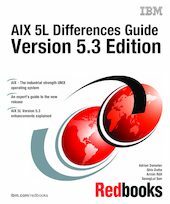 This IBM Redbooks publication focuses on the differences introduced in AIX 5L Version 5.3 when compared to AIX 5L Version 5.2. It is intended to help system administrators, developers, and users understand these enhancements and evaluate potential benefits in their own environments. AIX 5L Version 5.3 introduces many new features, including NFS Version 4 and Advanced Accounting, and exploits the advanced capabilities of POWER5 equipped severs, such as Virtual SCSI, Virtual Ethernet SMT, Micro-Partitioning, and others. There are many other enhancements available with AIX 5L Version 5.3, and you can explore them in this book. For customers who are not familiar with the enhancements of AIX 5L through Version 5.2, a companion publication, AIX 5L Differences Guide Version 5.2 Edition, SG24-5765 is available.